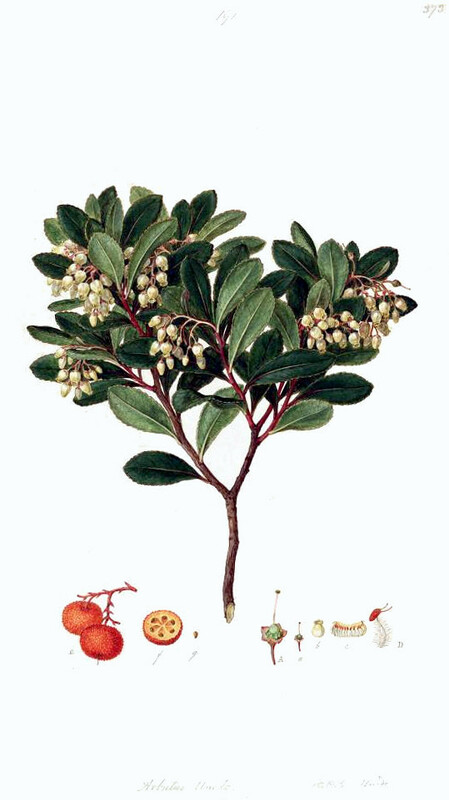 Beautiful Mediterranean evergreen shrub or tree, 2-3(-10)m, in culture usually 5m or less; bark red-brown; leaves alternate, oblong to obovate, tapering at both ends, serrate, dark shining green; flowers urn-shaped, greenish white to pinkish, about 6-8 mm long; terminal nodding panicles about 5 cm long; berry spherical, first green then yellow, scarlet when mature, warty, 1.5-2 cm across, „strawberry-like“. The main components of the volatiles of A. unedo fruits are alcohols, followed by aldehydes and esters. The main volatile compounds identified were (Z)-3-hexen-1-ol, 1-hexanol, hexanal, (E)-2-hexenal, and (Z)-3-hexenyl acetate, all with green odors. These are decreased in fully ripening state and mixed up with floral (linalool, α-terpineol) and sweet-waxy (methyl decanoate, mehtyl dodecanoate, ethyl dodecanoate) sensations. The dried leaves of Arbutus unedo, (Arbutus unedo leaves, Arbute leaves, Folia Arbuti, Erdbeerbaumblätter) contain the phenolglucosides arbutin (3%) and methylarbutin. Also present are flavonolglucosides, derived from kaempferol like juglanin (kaempferol-3-arabinoside) and avicularin (kaempferol-3-arabinofuranoside) or derived from quercetin like hyperoside (quercetin-3-galactoside); furthermore iridoidglucosides (unedoside as main glucoside, 0.2%) and tannin. Leave extracts are antibiotic and astringent, they are used as urinary desinfectant and for diarrhea.